Mine is en route from Amazon, will be in my hands tomorrow! I like the extra decklist they included in the article. All from one copy. Frozen Time - really like it. Frozen Time is really good. Stark has a similar card in AGoT. Just got it, and some quick impressions: milling is here, and in a big way. 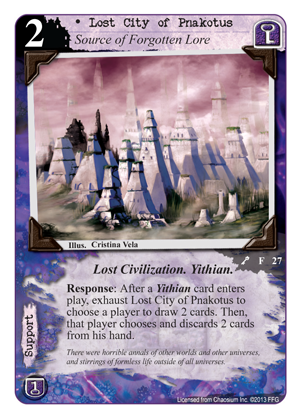 Yog now has even more tools for milling, and lots of the new Yog cards have effects that can be triggered out of discard, so they are the undisputed masters of the discard pile at this point. Best to start thinking right now about how to counter milling strategies. Shub has The Stone on the Peak (DD), the University has . . . umm, Atlantis (SoK) I guess, oh and Hapless Graduate Student (THBtS) . . . not efficient, but enough to avoid getting decked. Everyone else, start thinking. Scientists are now a thing, especially with Quantum Theorist, who very effectively allows for multi-color decks. 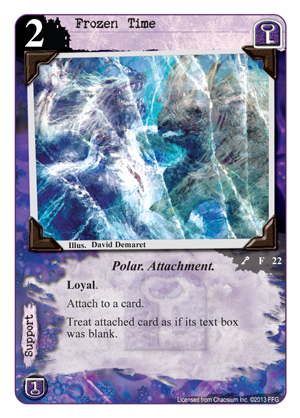 Also, there are more Explorers, more Polar, a neutral Prophecy, and a very good one at that . . . and Yog now has a Transient. Finally, my vote for the game-changer of the expansion is definitely Prepared Alienist (FFG didn't spoil it, so I won't!) Nikola Tesla is a close second, although he is very specialized, a very unusual strategy in a single card, and definitely specific to Yog. I agree it will change the meta somewhat, giving a neutral option to all houses other than Flux Stabilizer for MU. Just being able to play Tesla will be very cool, and I agree, he is a card you must have an answer for. Prepared Alienist is weaker than Flux Stabilizer (PT) in some ways - he's vulnerable to destruction (although the Toughness is nice), insanity, and exhaustion, which are all critical weaknesses. But he's also stronger in some ways, in that he prevents Stygian Eye (IT) shenanigans and so forth. As much as I like the Stabilizer, I think the Alienist is the better choice for many decks - particularly those that have a way to protect him, e.g., 607 Walter Street (KD). The difficulty in dealing with Tesla is that the easiest solution - direct destruction - isn't going to do much good against him; it just triggers his effect. And a deck built around Tesla is going to have plenty of ways to protect him and/or bounce him back from the discard pile. The best answer at this point, I think, will be insanity - although you can bet that a good Tesla deck will have a ready solution for that, like Disc of Itzamna (TBJ) or Tcho-Tcho Talisman (Core). 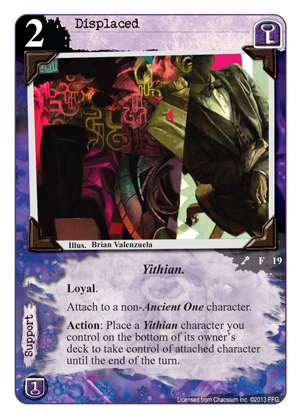 At any rate, I think it's a fascinating card, as it opens up a whole new way to win the game, something we haven't seen in some time (the Whateley cards are superficially similar to Tesla, but ultimately, you're still running stories, which with Tesla, you're not). Oh, and Tesla being vulnerable to insanity . . . someone's got a sense of humor. Yes, the limitations on taking control are going to be annoying to one of the major archetypes currently. I think we're going to see a large increase in text-blanking effects, which is probably the best answer to Tesla right now, in addition to Prepared Alienist. Called by Azathoth, Frozen Time, and Scholar from Yith will be very annoying to deal with. Especially now because with some characters they're better off in play than being destroyed or being in the discard pile. It's a very interesting twist to the meta, and it won't be as simple as destroying everything on the board and walk to stories undefended. Forced Response: After you trigger an effect from your discard pile, put a success token on Nikola Tesla. Disrupt: When Nikola Tesla would be destroyed, move all success tokens on him to any number of revealed story cards. Got my set last night. So far I really dig it. Tesla is an interesting character. I wonder if his ability actually works. With all the Hastur going around now, he is pretty easy to just drive insane. Thoughts on The Festival? It might be the best card in the set. You can so easily splash in 5-6 cards of a single faction and now be able to resource properly by pulling them out of your deck. Very interesting. Festival is amazing. It will be the focus of my next Pacta Arcana! I agree, nothing better than splashing in Museum Curators, Caverns of Flame, etc. out of faction. Oh nice! 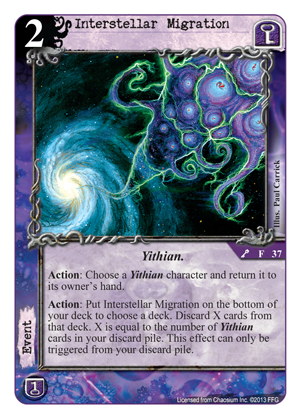 I've been thinking about a deck with x3 Khopesh of the Abyss (TSS) and then just one other Cthulhu card to yank with the Festival. Overall I think this is a pretty decent set. I do think some of the Yog cards are a bit to 'janky' for my tastes. You need a lot of cards in certain places for them to work, and as we all know you rarely get all the cards you need to make everything work. are the cards already spoilered somewhere? I do not own the box yet, so i'm curious whats in there. It looks like they are working on it here in the card browser. So far, 8 cards are posted. up to 24 now. Sorry the full spoiler isn't up yet. I had hoped to have it done this weekend but mothers day ate up more of my time than I thought it would. I'm hoping to have it finished tonight or tomorrow. Jim Black (The Descendant himself), posted a full spreadsheet spoiler on BBG: http://www.boardgame...eluxe-expansion. We will soon have a card-by-card first-take review up in the next few days! Be on the look out!